A study shows millennials expect to retire when they are 56. That's possible — with planning and sacrifice. Recent research from the online broker TD Ameritrade found that, on average, millennials expect to retire when they are 56. That’s more than a decade earlier than what’s considered full retirement age by Social Security. It’s a noble goal, but also a lofty one: If there’s one factor that can make or break your retirement plans, it’s the age at which you begin that coveted life stage. Here’s why. The concept is fairly simple when you break it down: Let’s say you start saving at 25. If you retire at 56, you have 31 working years to save for retirement. (And that’s probably generous — the TD Ameritrade research found that respondents plan to start saving when they are 36, on average.) Assuming a life expectancy of 95, the money you save needs to last 39 years. Compare that with someone who retires at 67 — that person would have 42 years to save, and would need that money to last 28 years. What that means: The saver who retires earlier needs to save more money in a shorter time. How much more? Consider a 25-year-old who earns $40,000 per year. Let’s say she wants to plan for a life expectancy of 95, and expects to earn an average annual return of 6% on her investments, with 2% salary increases per year. If she wanted to retire at age 56, she’d have to save 27% of income — $883 per month. Retiring at the standard age of 67 means saving a more reasonable 16% of income, or $533 a month. What might surprise you: That 27% is actually quite low, thanks to this hypothetical saver’s young age. 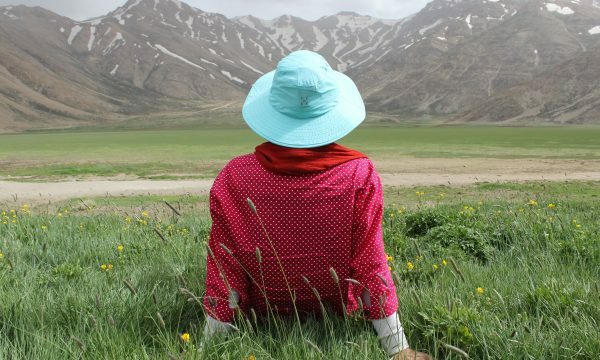 Someone who decides to embark on this early-retirement quest at age 35 would be in even more trouble, even if she already has quite a bit saved. 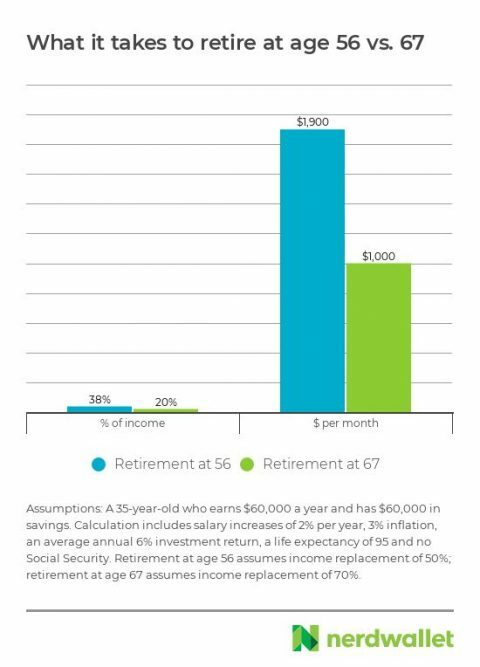 Using the same assumptions above, a 35-year-old who earns $60,000 and has $60,000 saved would still need to save 38% of income — $1,900 a month — to retire at age 56. That’s nearly twice what would be required if she planned to retire at the typical age of 67. One thing that makes early retirement possible for those who aren’t scared away by these high savings rates: If you’re saving 30% or 40% of your income, you’re already accustomed to living on significantly less than you earn. That can make transitioning to a lower income in retirement more seamless. Even so, it means a commitment to consistently live below your means so you can save a third or more of your salary. One more factor in the decision to knock off early: Whether you can access the money you’ve saved without paying extra penalties or taxes. Most retirement accounts levy a 10% penalty for distributions before age 59½. The major exception: Roth IRAs, which allow you to tap your contributions — but not investment earnings — at any time. You may also be able to tap money in your 401(k) without penalty if you leave your job — what the IRS calls separating from service — in or after the year you turn 55, Cary says. That rule applies only to current 401(k) plans, however — if you still have money in an old employer plan and you weren’t 55 or older when you left that employer, you have to meet the 59½ age barrier to avoid an early distribution penalty. That means early retirees may want to roll old 401(k)s into their current 401(k) before retiring. And if this all sounds like a lot of rules to swim through on your way to Margaritaville? Find a financial advisor who can help you.